Community-acquired methicillin-resistant Staphylococcus aureus (CA-MRSA) was a rare phenomenon until the past decade; now CA-MRSA is endemic in many communities and is the most common cause of skin and soft tissue infections presenting to emergency rooms. CA-MRSA is distinct from its hospital-acquired counterpart, and has caused devastating infections in many healthy individuals. The epidemiology of CA-MRSA continues to evolve, and the challenge is to use the most appropriate and effective therapeutic and preventative strategies against this pathogen. 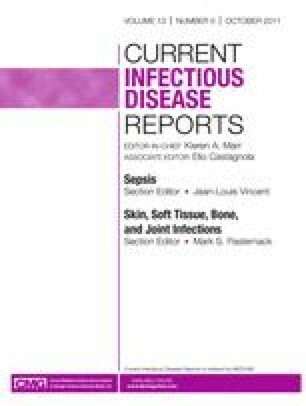 This article reviews the current epidemiology of CA-MRSA, its definitions, and common clinical manifestations in the community. The article also summarizes current therapeutic options for CA-MRSA as well as strategies to reduce the transmission and the impact of CA-MRSA in both community and health care settings. Centers for Disease Control and Prevention: Diagnosis and Testing of MRSA Infections. Available at: http://www.cdc.gov/mrsa/diagnosis/index.html. Accessed 04/19/2011. Centers for Disease Control and Prevention: MRSA and the Workplace. Available at: http://www.cdc.gov/niosh/topics/mrsa/. Accessed 4/21/2011.